The BRUCE Project is now complete although we will be continuing to work on the SolrEyes software so please do get in touch if you would like to find out more about it. Lorna, Richard and Rosa are now working with colleagues at Kings, the British Library, Cottage Labs, Exeter, EuroCRIS and Edinburgh on the JISC-funded UK Research Information Shared Service (UKRISS) project. The project is looking at how research information is currently managed and reported across the HE sector in the UK in order to identify the feasibility and possible scope of a shared national service. To find out more about UKRISS visit the project blog. 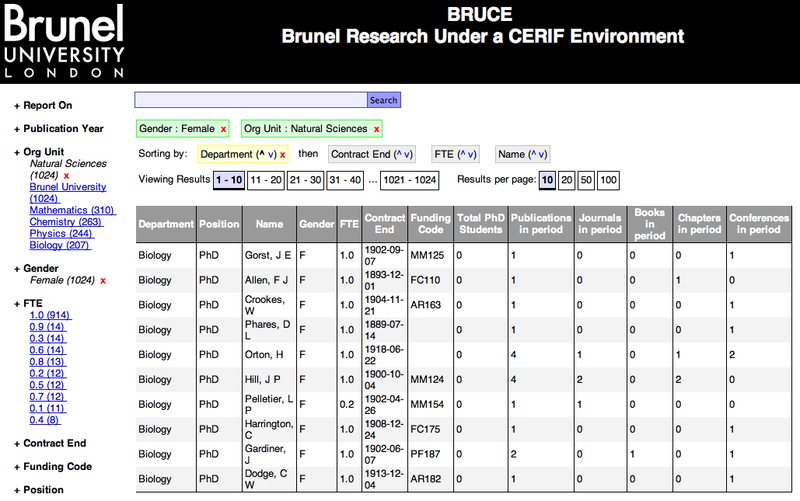 Part of the challenge of the BRUCE project is to take a highly relational model like CERIF and convert it into something which can be adequately indexed for searching and faceting. Typically, the keys on the left come from a set of known terms, while the values on the right can vary arbitrarily. Therefore, when you search for documents belonging to “Richard”, you are asking which documents have the value “Richard” associated with the key “name”. In addition, keys are often repeatable (although depending on the search index schema this might not be always the case), so you could have multiple “name” keys, with different values. The objective, then, is for us to convert the graph-like structure of CERIF (that is, it has entities and relationships which do not follow a hierarchy) into the flat key-value structure of a search index. It should be clear from the outset, therefore, that data-loss will necessarily result from this conversion; it is not possible to fully and adequately represent a graph as a set of key-value pairs. The project aimed, instead, to extract the key information from the CERIF schema from the point of view of one of the Base Entities. There are 3 Base Entities in CERIF: Publications, People and Organisational Units. Since BRUCE is concerned with reporting principally on staff, we selected People as the Base Entity from which we would view the CERIF graph. By doing this we reduce the complexity of the challenge, since a graph viewed from the point of view of one of its nodes behaves like a hierarchy at least in the immediate vicinity (see the real analysis of this, below, for a clear example). Our challenge is then simplified to representing a tree structure as a set of key-value pairs. The second trick we need to use is to decide what kind of information we want to actually report on, and narrow our indexing to fields in the CERIF schema which are relevant to those requirements. This allows us to index values which are actually closely related to eachother as totally separate key-value pairs: as long as the index provides enough information for searching and faceting, it won’t matter that information about their relationship to eachother is lost. This is fine if there is only one publication by the person, but if they have multiple publications it would not be possible to tell which publication_date was associated with which title. This configuration loses data by not maintaining the links between publication_date and title, but is completely adequate for the indexing and faceting requirements. To meet our original requirement stated above we can just count the number of publication_date keys which contain a date which lies within our desired time frame and return this integer count, while simultaneously listing the titles of the publication. The fact that these two pieces of information are not related in the index makes no difference in producing the desired outcome. With the exception of the Org Unit data (marked with **), the result is a straightforward enough hierarchy. We can avoid considering the graph that emerges under the organisation unit data by ensuring that the cfPers_OrgUnit table contains all the relevant relationships that we want to consider during indexing, so that we don’t have to attempt to index the org unit graph when preparing an index from the perspective of the person. The Solr index allows us to specify a field name (the key, in the key-value pair), and whether that field is repeatable or not. Each set of key-value pairs is grouped together into a “document”, and that document will represent a single person in the CERIF dataset, along with all the relevant data associated with them. When we have fully built our index, there will be one document per person. entity single “cfPers” Indicates that this is a person oriented document. This allows us to extend the index to view other kinds of entities as well, all represented within one schema. primary_department single cfOrgUnit/cfName This differs from org_unit_name in that it is the department that the person should be considered most closely affiliated with. This would be, for example, their department or research group. It is used specifically for display and sorting, which is why it may only be single valued. fte single cfOrgUnit/cfFraction The fraction of the time that the person works for their organisational unit which is tagged with cfClassId of Employee. publication_id multi cfResPubl/cfResPublId This lists the ids of all the publications of any kind which the person published. journal_date multi cfResPubl/cfResPublDate This is the list of dates of publication of all publications which have a cfClassId of “Journal Article”. journal_id multi cfResPubl/cfResPublDate This is the list of ids publications which have a cfClassId of “Journal Article”. book_date multi cfResPubl/cfResPublDate This is the list of dates of publication of all publications which have a cfClassId of “Book”. book_id multi cfResPubl/cfResPublDate This is the list of ids publications which have a cfClassId of “Book”. chapter_date multi cfResPubl/cfResPublDate This is the list of dates of publication of all publications which have a cfClassId of “Inbook”. chapter_id multi cfResPubl/cfResPublDate This is the list of ids publications which have a cfClassId of “Inbook”. conference_date multi cfResPubl/cfResPublDate This is the list of dates of publication of all publications which have a cfClassId of “Conference Proceedings Article”. conference_id multi cfResPubl/cfResPublDate This is the list of ids publications which have a cfClassId of “Conference Proceedings Article”. These terms are encoded in a formal schema for Solr which can be found here. Apache Solr provides what it calls “Data Import Handlers” which allow you to import data from different kinds of sources into the index. Once we have configured the index as per the previous section we can construct a Data Import Handler which will import from the CERIF MySQL database. This query is at the root of the Data Import Handler, and selects our cfPersId which will be the central identifier that we will use to retrieve all other information, as well as any information which we can quickly and easily obtain by performing a JOIN operation across the cfPers* tables. This query selects the first person’s name and performs the appropriate concatenation to turn the three name parts cfFamilyNames, cfFirstNames and cfOtherNames into a usable single string. This query selects the person’s contract end date by looking for the organisational unit to which the person’s relationship (cfPers_OrgUnit) is annotated with the cfClassId ‘Employee’. This query selects the ids and dates of publications by the selected person which have a class of ‘Journal Article’. Here we will not go into this at any further length; instead the code which provides the Data Import functionality can be obtained here. It is probably worth noting, though, that these queries are quite long and involve JOINing across multiple database tables, which makes reporting on the data hard work if done directly from source. The BRUCE approach means that this is all compressed into one single Data Import Handler, and leaves all the exciting stuff to the much simpler search engine query. used when presenting a “document” to the user. Sometimes the value is a function of the actual indexed content. Note that a more thorough treatment of the Solr index would split the fields up into multiple indexed fields which are customised for their purposes, but that we have not done this in the prototype. For example, fields used for sorting will go through normalising functions to ensure consistent sorting across all values, while displayable values will be stored unprocessed. We can now produce a user interface like that shown in the screen shot below. The approach used here could be used to extend to more features of the person Base Entity, but also other Base Entities (and, indeed, any entity in the CERIF model) could be placed at the centre of the report, and its resulting hierarchy of properties mapped into a set of key-value pairs, and all could co-exist comfortably in the same search index. SolrEyes is a basic but effective wrapper around Apache Solr which has been developed by the BRUCE project as a replacement for Blacklight. As per our previous post, significant problems were had in stabilising Blacklight, so a brief exploratory was carried out in attempting to replicate that functionality which was necessary to the project (not all of the existing functionality was necessary for our needs). Having been successful we went on to introduce support for ranged facets, allowing us to limit by date or any other rangeable field. SolrEyes uses the SolrPy Python library to communicate with Apache Solr and the Mako templating language to provide the User Interface. It presents the results of search requests to the user with facet counts and current search parameters alongside the search results themselves. It allows for facets to be added and removed, as well as allowing for sorting and sub-sorting and fully supports flexible paging over result sets. Note that the data presented in these screen shots is artificial, and should not be considered indicative of anything. It is strongly inspired by Blacklight, and provides all of the basic search and facet functionality from that system. In addition, the configuration has been done as a JSON document which makes it easier to separate from the application and to modify and extend. A key difference between SolrEyes and Blacklight is that SolrEyes comes pre-prepared for some reporting features. Every search constraint and every search result field is passed through a processing pipeline which converts it from the value in the Solr index into the display value, and that pipeline is created in configuration by the user. This shows a configuration option which exchanges facet values for display values in the gender field. This approach could also be used, though, to substitute date ranges for descriptions, such as “RAE 2008”, or other useful terms. We wish to present counts of the number of publications that researchers have published in the reporting period. The reporting period can be set by choosing the appropriate date range from the navigation (this constrains the publication_date field to contain values from that range). This means that we cannot index this data in advance, as it is dependent on the exact date range that the user selects, which could be absolutely anything. Instead we pipe the date range selected and a result field which contains the dates on which the user published to a function which can compare those publication dates with the constraint range and return a count of those publications which fall within it. In order to achieve this effect the documents in our index contain a list of the dates upon which the author published. This shows a configuration of a “dynamic field” which presents the count of values in the index field publication_date which fall within the constraining facet publication_date. This screenshot shows a single record which has been constrained to all publications from a single year (see the green box which displays the constraint). The final 6 result columns contain values which are dynamically generated by comparing the publication dates of the different publication types with that constraint. So, here, S W Burnham is seen to have published 2 items in 1880: 1 Book and 1 Conference Paper. SolrEyes has proved sufficiently simple to operate and configure while providing useful functionality that it has also had some take-up outside of the project. The functionality was designed deliberately to be flexible to other use cases (although the reporting use cases were the ones focussed upon by the project team), and as such it has also found use as a front-end for a bibliographic data index. The Open Bibliography project (which provided the MedLine data that the BRUCE project built the CERIF test data from), the OKF and Cottage Labs are also involved in the development of the BibJSON standard and related BibServer software which powers the under-development BibSoup service. This service is using SolrEyes to operate the search and faceted browse features, and so the software is already getting feedback and enhancements from external developers. We hope that SolrEyes fulfills a niche for a simple but powerful interface to Apache Solr. Its advantages over Blacklight and VuFind are in the simplicity of the environment and a generic approach to presenting the contents of a search index (both Blacklight and VuFind are more geared towards providing catalogue interfaces). The SolrEyes software can be downloaded here. Next go into the directory where you downloaded SolrEyes and modify the config.json file with your custom configuration (documentation is inline). This will start SolrEyes on port 8080 on localhost. We are very interested in taking the development of SolrEyes forward so please contact us if you have any questions, feedback or suggestions. At the outset of the project we had planned to use Blacklight as the user interface to Apache Solr through which we would present our reporting interface. This post describes the reasons that we subsequently abandoned this approach and developed an alternative which met our requirements. The principle issue that we had with using Blacklight was simply due to the instability of the install process. Although Blacklight is a Ruby on Rails application, and should therefore be highly portable, the technical team had significant problems getting it to work across all the relevant platforms. Much of the development work for the project took place on Linux (Ubuntu) and Mac OS X, but the primary deployment environment was to be Windows; as such, portability is very important. Installation on Ubuntu was difficult, although not impossible, and we blogged a How-To guide which patched some holes in existing online guides. Results on Windows were variable, with issues of dependency version resolution being the primary difficulty (although this was not the only issue, and was also not limited to the Windows install). Installation on Mac OS X proved too error prone to complete at all. While we anticipate that these installation problems would ultimately be resolvable, they reduced our confidence in Ruby on Rails as a workable environment and also held up progress on the interesting parts of the project! Another limitation for Blacklight was that ranged faceting was not supported in the default install. Instead there was an experimental add-on available which would have offered this feature. Ranged faceting is a key component for the project as the reporting needs to be limited by date (for example, per academic year or RAE/REF period). Ultimately we decided that – given the difficulties getting started with Blacklight – adopting an experimental add-on would raise the risk of project failure to an unacceptable level (given only 6 months for the whole project). For these reasons we embarked on a short experiment to explore the difficulty of providing a basic reporting UI from scratch which would meet the project requirements. We found that it took a very small amount of time to develop the basic facet viewing features, and so we continued to introduce ranged searching and a more appropriate report generating interface. Having found that we could provide a more stable application (written in Python) which would provide us with the desired functionality, the project therefore decided to abandon Blacklight and dedicate some development time to our own interface. It is worth noting that the important features of the reporting approach actually lie in Apache Solr – this does all the hard work in indexing, searching and faceting the content. The User Interface exists purely as a presentation layer, so we do not lose anything by switching from Blacklight to a custom development. A future post will provide more details about the custom development. How to map the data sources such as HESA, SITS, HR and Publications data into CERIF. In some cases there will be clear mappings, and in other some creativity may be required, and in yet others it may not be possible. A set of Solr configuration files and data importers which relate the MySQL CERIF database to a set of flat key/value pairs which meet the requirements of the project’s exemplar report. No general configuration has been produced for CERIF yet, as we are focussed on this specific vertical. Some installation and configuration experience with Blacklight. We have done a number of demonstrations of Blacklight to investigate what the final interface will look like, but as yet no realistic data has been presented through it. A high-spec dedicated project server with the capacity for storing and processing the large quantites of data that will be generated throughout has been installed and is ready to start working with the data. Overall, mapping data to and from CERIF has not been too troublesome. It is a relational standard, which means that flattening it for Solr has been a bit tricky (more on that later). In addition, it does not always have clear ways of representing the data we want to represent, and it appears that the Semantic Layer is where most of the complexity will ultimately reside. Solr has been reliable (if complex to configure) throughout the process, and the project team is now comfortable and confident that it meets most if not all of the requirements that will be placed on it. Blacklight has so far been the weak link in the project. It is extremely difficult to install and configure, and no two installations go the same way so a large amount of time has been sunk in trying to make it work at all. It is partly for this reason that the project is not yet displaying the data from Solr in Blacklight. As CERIF is a relational format, flattening it for indexing by Solr has been a careful task for the project. We cannot represent all of the data in the CERIF database exactly as it appears in MySQL, since Solr does not strictly have the relational qualities of a database. Instead we have begun to construct solr documents (effectively these are Object Classes) which are designed to meet the reporting requirements. That is, for our exemplar report (see linked presentation), which is focussed on the individuals, we create Solr documents which have the person as the key entity, and we add to the document extensive information about the organisational units that the person is part of, their publications, and so on. Later we will construct documents which are designed to meet other reporting requirements, and may therefore be organisation or publication oriented. With a well designed Solr schema, all these different documents will co-exist comfortably side-by-side in the index, and we’ll be able to generate a variety of different kinds of report based on that data. Generate reports from search results. The the project is looking at Prawn, a rails application which can generate PDFs of the results. Saulius Maskeliunas has very kindly agreed to allow us to share the photographs that he took during the recent euroCRIS Membership Meeting in Bologna. They bring back happy memories of a really useful meeting and a truly glorious city. Rosa will be presenting a poster (BRUCE_ARMA_2011) on the BRUCE project at the Association of Research Managers and Administrators (ARMA) Conference in Glasgow on the 7-8th June. Please come along to say hello and find out more about what we are up to with the project. Enter your email address to subscribe to this blog and receive updates on the progress of the project.